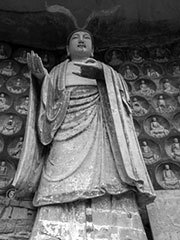 The Dazu Stone Carvings are a series of Chinese religious sculptures and carvings, dating back as far as the 7th century A.D., depicting and influenced by Buddhist, Confucian and Taoist beliefs. Listed as a World Heritage Site, the Dazu Stone Carvings are made up of 75 protected sites containing some 50,000 statues, with over 100,000 Chinese characters forming inscriptions and epigraphs. The sites are located on the steep hillsides within Dazu County (near the city of Chongqing, China), with the high points being the carvings found on Mount Baoding and Mount Beishan. One of the most beautiful carvings is the sleeping Buddha- Sakyamuni as he is called in China. It is 31 meters (101 feet) long, in a reclining position, and surrounded by much smaller statues of his mourning disciples and family members.